How the Flip Video is turning the amateur video recording industry on its head. Home videos are great, especially when you have a child. Looking at movies of your family adventures over time is the most sappy fun you can have. But camcorders are a bit clunky to lug around, so lots of experiences never get captured, and after you come back from vacation or the school play or whatever it might be and you need to get the footage from the tape to the computer, it takes as long to import the footage as it takes to view. These are certainly first-world problems, no doubt about it. Whaa, my camcorder is clunky! Whaa, getting footage onto my computer takes time! Nevertheless, the time required to import video puts enough friction into the process that it becomes something you put off. Meaning there’s a shoe box of tapes you’ll import one of these days, really, sitting in a closet somewhere. The Flip Video gets rid of both issues by recording on solid state memory and being about the size of an original iPod. It also costs a little over $100. While certainly not cheap, per se, it’s still cheap enough that you don’t have to worry too much about the device itself. This means you’ll shoot a lot more video and actually put it in the computer where it can be processed and shared. Being small and light also means that a child can use it … after several fire-and-brimstone speeches about always, always, always using the wrist strap. Obviously, in order to cut cost, corners also had to be cut: There’s no optical zoom, the sound quality is far from great, it uses AA batteries, and the device itself feels plasticky and low-rent. Those drawbacks in mind, there’s still magic in carrying a camcorder in your pocket and getting instant gratification by plugging it in to your computer as soon as you get home. 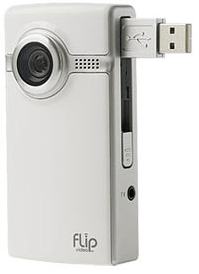 Going from a big tape-based camcorder to a mini-device like this changes the whole game when it comes to home video. If you have children, some disposable income, and a computer to edit video, you should look into the Flip. Caveat emptor, though: The Flip I have at home is my third one: The first two went back to the store with stuck pixels on the sensor. Based on that experience, I definitely recommend your first Flip shoot to be of a dark room and a white wall to tease out any pixel problems.